A root canal is a treatment used to repair and save a tooth that is badly decayed or becomes infected. Without treatment, the tissue surrounding the tooth will become infected and abscesses may form. This may lead to the loss of the infected tooth. 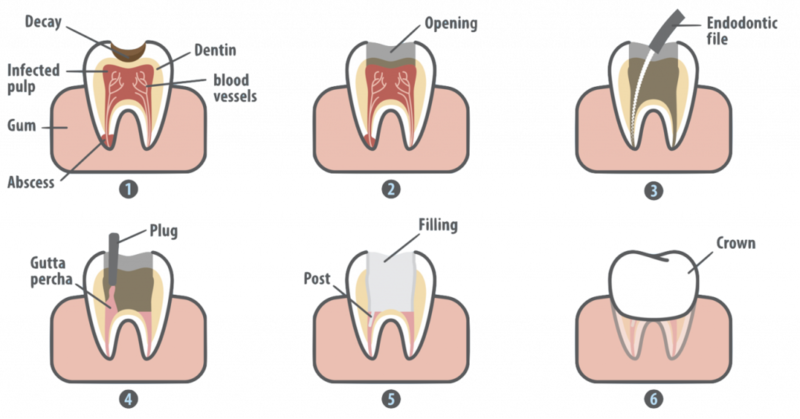 The typical procedure to treat a root canal includes the following. The surrounding area of the infected tooth is anesthetized. The length of each canal is determined. Canals are then widened and cleaned. Tooth may require protection and reinforcement with a temporary filling after procedure. You will need a follow-up visit after the root canal treatment. At this visit, your dentist will remove the temporary filling on the tooth and replace it with a regular filling or a crown to protect your tooth from further damage. A metal or plastic post may also be placed in the root canal to help make sure the filling materials remain in place. This helps support a crown if you need one.